Back in the days, learning to ride a bike meant sitting on a bicycle with two training wheels attached to the back axle. But things have changed these days as parents are turning to balance bikes. Unlike traditional bikes, which only taught us to pedal a tricycle, a balance bike ditched those training wheels. It is still a two-wheeled bike but minus the pedals. It features low seats so children’s feet can easily reach the ground. The riders’ knees are bent, and they use both their feet to push the bike and hold it upright. 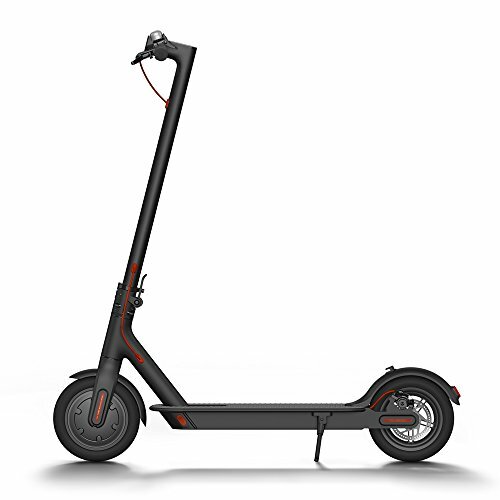 As soon as they have mastered balancing and steering and their speed and familiarity increase, they can lift their feet off the ground and enjoy exciting moments of balanced flight on two wheels. Balance bikes are a great way to teach kids as young as 18 months old how to ride a bike. It gives them more control, and they are less likely to get stuck on uneven surfaces. They can glide and jump with ease while minimizing the risks of getting scrapes and bruises from crashing. In recent years, manufacturers have added extra features on balance bikes. They have installed brakes and higher quality tires and wheels. But at the end of the day, they are all used in the same way and for the same reason. 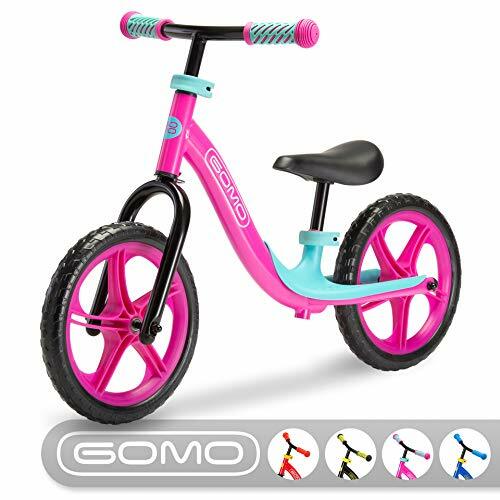 Short for “Get Out More Often,” GOMO Balance Bikes are designed for those who want a high-quality, budget bike. It is best for kids between 18 months and 5 years old. Its seat height can be adjusted from 12” to 17.5”, giving kids more room for growth. The seat is installed well so it will not easily spin around. The bike also has a wide-grip T-bar handle that measures up to 14.6” and a solid, lightweight build at only 6.4 pounds. This new balance bike provides a bigger space between the handlebar and the seat. This improves the overall comfort of the kids. It also allows them to extend their arms properly, giving them better control of the bike. It has a long wheelbase and high handle height. The combination of these two features provide better balance and force kids to sit more upright so their weight is more centered on their hips. The bike comes with plastic rims and EVA foam tires, which will never go flat. It also has a built-in footrest plant that most kids used during tricks. Although this is considered a minute detail, the grips have bumpers at the end for cushioning. A turning limiter has also been installed to prevent sharp turns. ONE DAY SALE! JUST LIKE A BIG KIDS BIKE! Do you remember your first toddler bike? It needed to be light enough to drag, but strong enough for those moments of frustration when you threw it to the ground! It had to be safe, but of course, look cool too! So naturally we packed all that into the GOMO, so your kids can fondly remember their first bike too! 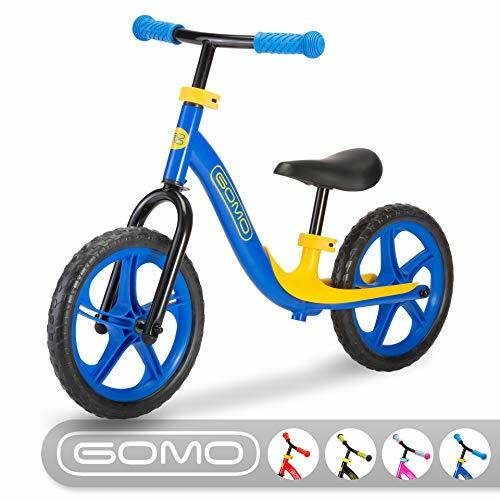 SAFETY FIRST: The GOMO kids bicycle has a turn limiter for greater control while they master the skill of steering. The custom footrest lets them place their feet safely as they go fast for their very first time. Through-Wheel Axles stop wheels from falling off while the padded seat lets kids hit their first tiny "all terrain bumps" without jarring. STURDY ENOUGH TO GROW WITH THEM! To ride like the big kids', there'll be a few spills along the way. So we gave the GOMO push bike a Steel Frame that's as light as it is tough. It's the first bike that grows with kids and their confidence! The adjustable seat allows for a ride height 12" - 17.5" and grows from 18 months to 5 years; and up to 60lbs. LIGHTWEIGHT: GOMO means "Get Out More Often", so we've made this boys and girls bike 6.4 pounds - light enough to do exactly that! Toddlers can lift and drag it, just as easily as they can scoot along. 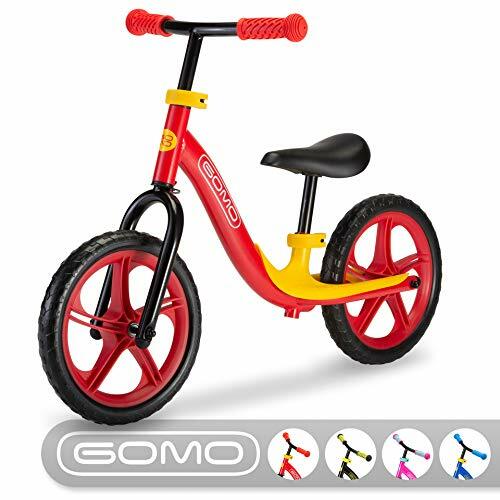 The 14.6" T-Bar with its special GOMO Grips are easy for little hands to grab while the 12" Heavy Duty Wheels, can be dragged over gravel without punctures. 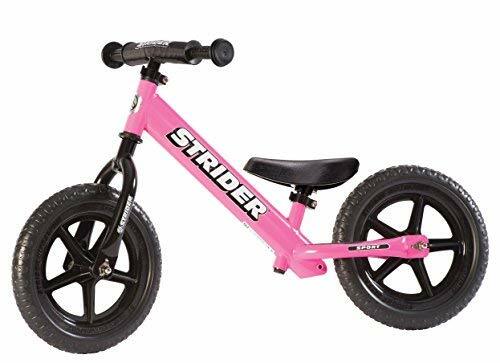 Strider has long been known for its well-designed, well-built bike, and the Strider 12 Sport Balance Bike is no exception. 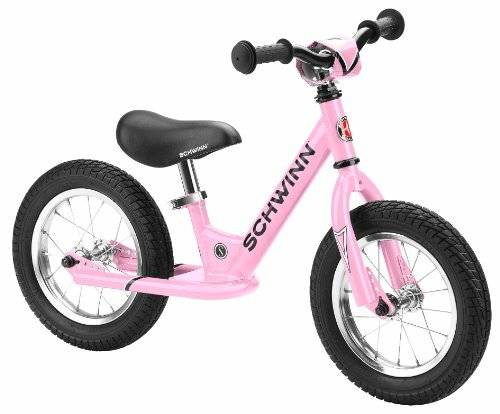 Suitable for kids between 18 months and 5 years old, this lightweight bike is easy to adjust and handle. Weighing in at only 6.7 lbs, this is one of the lightest and smallest balance bikes on the market. But really, within its price category, its well-designed geometry is a gem. Strider Sport has a narrow handlebar grip with knob-like ends. It features puncture-proof, foam tires that provide good traction. It also comes with a non-intrusive footrest and unique footbrake, which can easily be activated using their heels. FirstBike has helped transform the balance bikes industry in the United States, thanks to its wide range of safety and durable features. 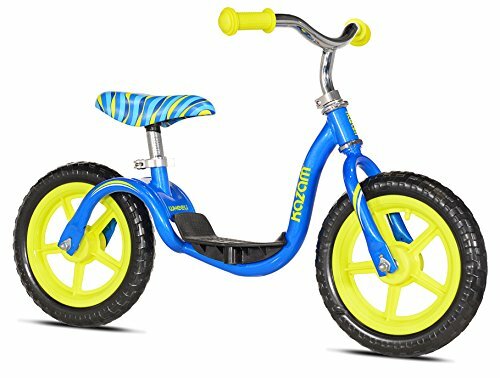 This waterproof bike is suitable for children up to 5 years of age. It boasts of a smooth and unique nylon composite frame, which lessens injuries caused by falls. The bike’s U-shaped saddle inhibits children from sliding off their seats. It also has a turning limiter, easy knob dial seat post adjuster, and handbrake. To customize, there are several accessories you can buy, including a lowering kit, a monoski, and molded nylon baskets. Of note, a monoski transforms the bike into a sled. Although its safety features remain unmatched, it has a flexing frame that is not recommended for taller and heavier kids. 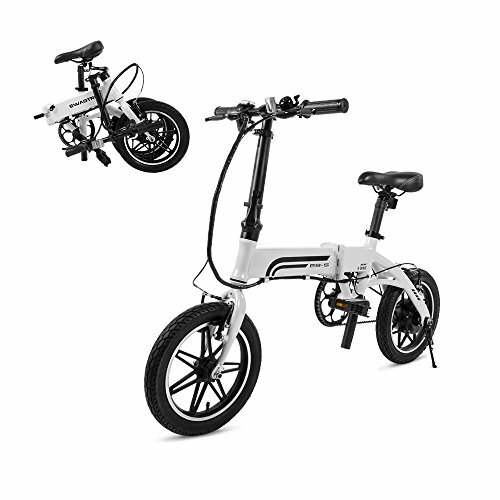 FirstBike has five different models, namely, the Basic, Cross, Street, Limited, and Special Edition. The last four models have identical features and differ only in color and tires. For instance, the Cross model is best for off-road surfaces, whereas the Racing and Limited Edition have more cushioning. The Basic model does not come with air tires and a handbrake. 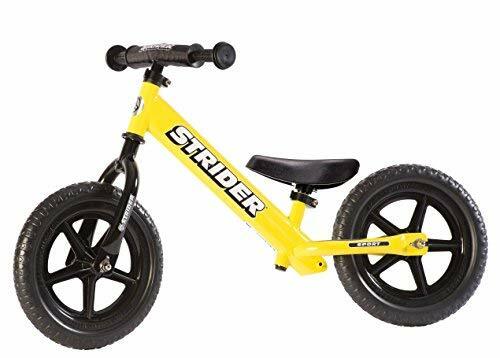 The safest bike for kids between 2 and 5 years old. No pedals, no training wheels but that's NO PROBLEM, quite the opposite! From the name itself, Cruzee Ultralite weighs in at only 4.4 lbs making it suitable for kids as young as 18 months old. The bike features a highly adjustable two seat posts that range from 11” to 19” and handlebars that can be raised up to 4”. Both can be adjusted through a tool-free quick-release lever. The bike comes with metal rims and air tires. It has sealed bearing hubs that are securely mounted using 0.5” flat and scratch-proof axle bolts. Other notable features included are quick-release clamps and a well-padded seat. It also boasts of a rust-proof, anodized aluminum frame that provides the bike its attractive and shiny metallic finish. MAKE A LONG TERM INVESTMENT IN YOUR CHILD'S HAPPINESS - Constructed of rust-free anodized aluminum, Cruzees come with a LIFETIME WARRANTY. Wide seat and handlebar adjustment lets the bike grow with your child deliver as much as 3 years of use. THE LIGHTEST BALANCE BIKE IN THE WORLD - In cycling, lightweight equals performance & safety. 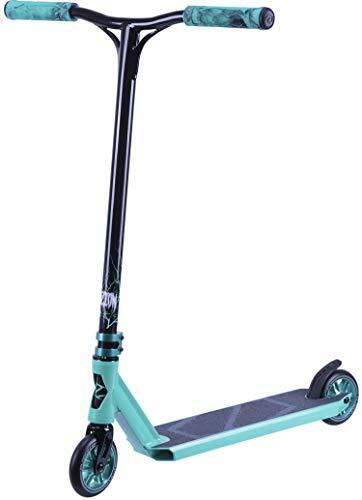 Weighing just 4.4lbs, the Cruzee delivers effortless control & builds confidence in the smallest riders, no matter what terrain they choose to ride. 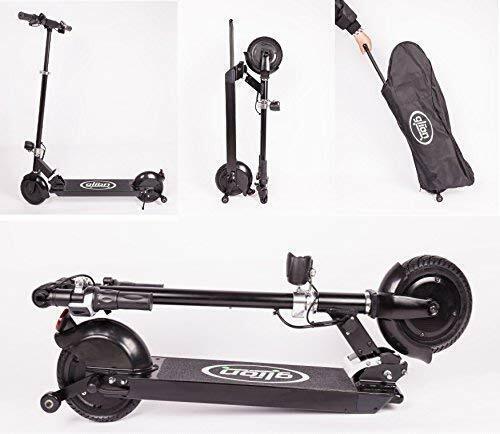 THERE'S SO MUCH TO LOVE ABOUT CRUZEE - The Cruzee is incredibly comfortable with soft grips, a super comfy seat, low-profile axle bolts & flat-free foam rubber tires. Your child will love it, and you will too! 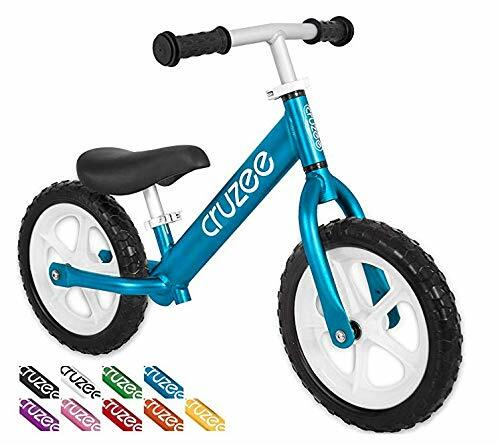 This is another budget balance bike in the list, pricing at under $100 only. Weighing in at just 10.5 lbs, this bike is a perfect match for kids between 3 and 4 years old. You can easily adjust its seat height from 14” to 16.5”. 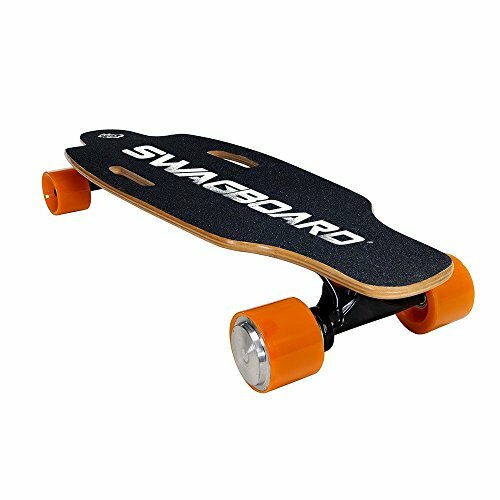 It has a solid build and comes with air tires, which have a good solid feel. The Schwinn comes with a protruding footrest far out from the sides of the seats. This may be a problem for small children as there is a tendency for their calves to hit the footrest. Pre-schoolers won’t likely face this issue though. If you are hunting for a do-it-all balance bike, then this baby is for you. Nothing beats the Road Runner’s chic diamond frame when carrying off drop bars. The drop handlebars give riders a sense of control and stability, thanks to a lower sense of gravity. 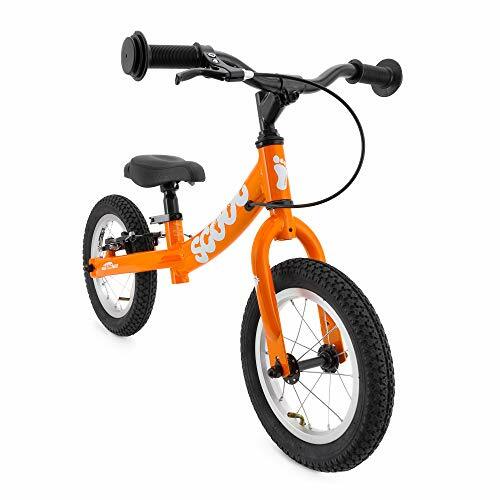 Weighing in at 7.9 lbs, this balance bike is great for kids from 3 to 5 years old. You can easily adjust its seat height between 14” and 18.5”. The Road Runner boasts of a lightweight aluminum frame, aluminum fork and steerer, and aluminum stem. It also uses riveted faux leather seat to achieve style and comfort. Designed for the future road riders, the Road Runner has low resistance cartridge bearings and an integrated headset. It comes with a 14” pneumatic wheels too. If you have been binge-watching the famous Netflix series Shark Tank, then you may have probably seen this in one of its episodes. This balance bike is like no other as it comes with a patented, ergonomic step-in footrest. 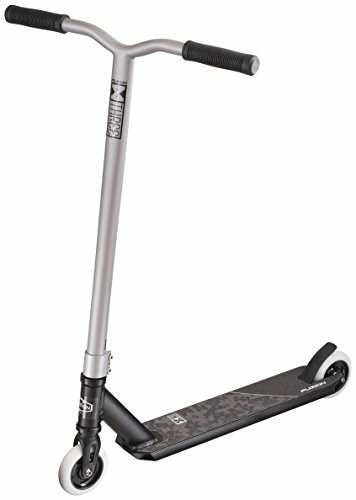 Thanks to this, kids no longer need to lift their legs in the air when gliding. The bike features foam tires, which work pretty fine in the dirt. Compared with the bike in this list, the v2e is a bit heavier at 9.9 lbs. But for its price range, this is one of the lightest. Its seat height can be adjusted between 14” and 17”. However, the v2e bike frame can be too wide for petite kids. This is highly recommended for average- to large-sized kiddos. Haro is no stranger to many balance bike enthusiasts because of its premium quality. In case you do not know, Haro is a manufacturer of high-quality BMX and mountain bikes. Thus, it is safe to say that the z10 got those same manufacturing skills. The Haro z10 can accommodate kids as young as 18 months old. 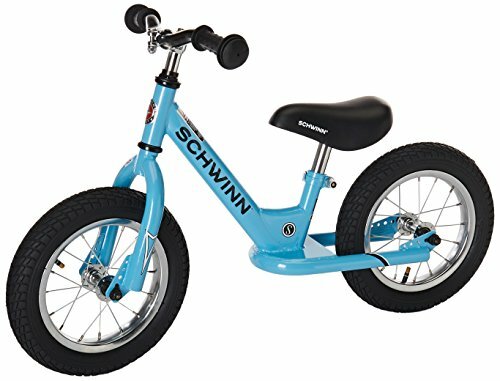 The seat can be adjusted to as low as 11” and its smaller frame and wheels make it a very good choice for very young kids. The Haro z10 is a sturdy bike that can handle a lot of abuse. However, the bike contains some exposed bolts, which can be a concern for some parents. But for its price of under $100, the Haro z10 is definitely a bang for the bucks. 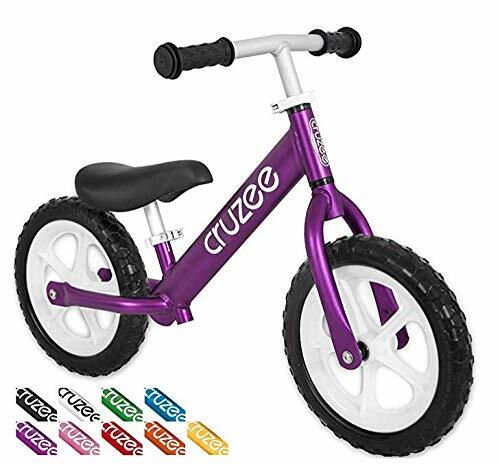 In terms of overall quality construction, size, and affordability, Haro z10 balance bikes are a great choice for toddlers who seek some adventure. 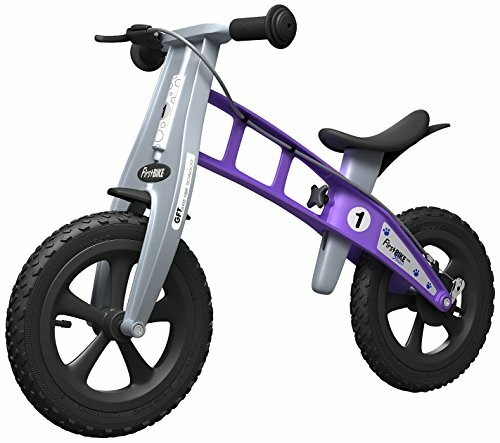 Ridgeback has been crafting premium bikes since the 1980s, and its excellent quality can be seen in its balance bikes. 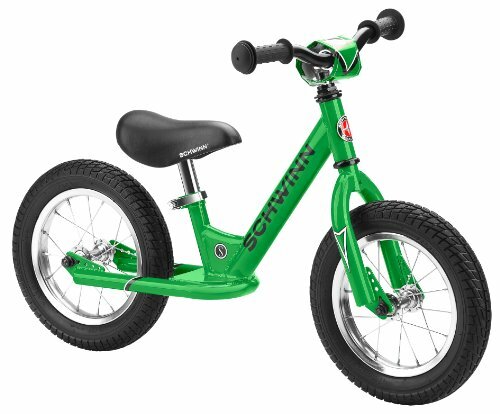 Aimed at kids between 4 and 8 years old, this bike is made for children who want a worriless learning experience. This is a bit heavier at 11.6 lbs, but it would not be a problem since it is meant for an older age group. Compared with most on the best balance bikes list, the Scoot is taller and longer. And performance-wise, this is more like a bike than a toy. It also comes with two seat posts, allowing for a seat height adjustment of between 14” and 22”. You can easily adjust the seat height using a quick-release seat post clamp. Also, swapping the seat post is as simple as removing one screw below the saddle. The Scoot is certainly built to last with its sturdy 6061 aluminum alloy. It has a longer wheelbase and more upright handlebars. It boasts of puncture-resistant 12” inflatable air tires and extra-wide handlebars. Such features allow older riders to assume a more natural and comfortable riding position. The balance bike also comes with handbrakes and turning limiters. Available in 8 vibrant colors to suit any taste. Impeccably painted finish with decals under the topcoat make Scoot easy to clean. 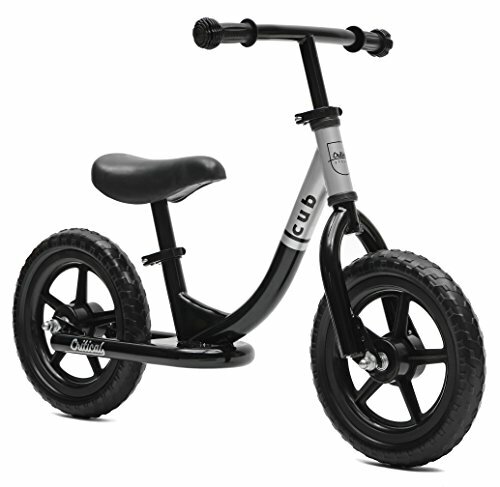 The Cub is one of the most sought-after from the best balance bikes list, thanks to its unique foot-to-floor construction. It has a nice color combination and great safety features that can ease parents’ minds. Crafted for kids between 18 months and 5 years old, the seat can range from 12.5” to 16”. However, for a small bike, this can be a bit heavy at 9.2 lbs. It takes durability to a whole new level having one of the strongest frame designs made from high-tensile steel. The frame’s step-thru design provides a low profile. It also gives kids more room for growth as it features an adjustable handlebar and ergonomically designed seat. The Cub has puncture-proof 12” foam tires, which are maintenance-free and never go flat. However, foam tires offer less traction, little cushioning, and minimal tread, which decreases their road grip ability. Considering its material and size, the Cub is light enough at just 9 lbs. However, its footrest is too big it can interfere with kids during a stride. Here’s a rule of thumb when considering the overall weight of a balance bike: it should not weigh more than 30% of your child’s weight. For instance, if your child weighs 30 lbs and we apply this rule (30 lbs x 0.30), the best balance bikes should weigh no more than 9 lbs. Aside from ensuring safety, a lightweight balance bike is also much easier to grab and carry. Failure to choose the right bike size poses kids at risk of danger and inhibits them to properly learn how to ride a bike. That being said, buy a balance bike that fits your kids now and not something that they will eventually grow into. 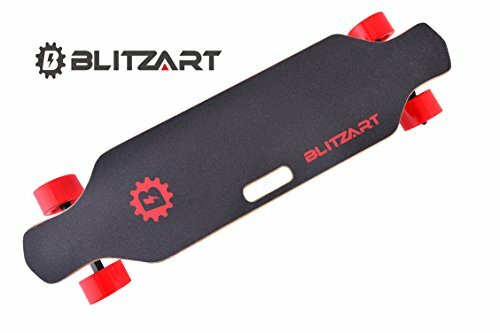 How to find the right size? Find out your child’s inseam measurement. The perfect seat height for your kids should have them sitting on the seat saddle while their feet are flat on the ground and knees slightly bent. A measurement of less than 1 inch than the child’s inseam is a good starting point. One more thing to consider the best balance bikes will feature an easy-to-adjust seat height function. This will save you a lot of time and energy especially if you have two kids sharing one balance bike. 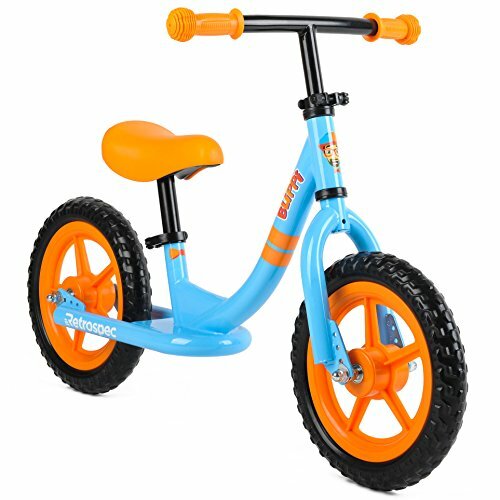 There are different types of tires available for balance bikes, and all come with various tread patterns. Keep in mind the kind of environment and surface condition the bike will be used in. For example, EVA foam tires weigh less than all the other bikes and are maintenance-free. They are good for both indoor and outdoor use. However, they have little cushioning and less traction. On the other hand, the air tires are the standard and can provide cushion and comfort. But on the flip side the air tires can be prone to flats, and air pressure maintenance is required. Rubber tires do not go flat like air tires, are maintenance-free, and have a lot of traction. But they are most suitable for indoor areas only. EVA, rubber or foam tires can all be suitable. Foam tires are great because of their weight and are reliable because they don’t go flat. They can wear down so its a give and take between foam tires and air. 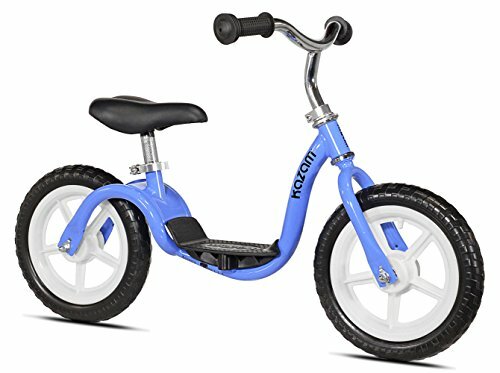 However, foam tires are our pick because we are talking about kids who need lightweight balance bikes. 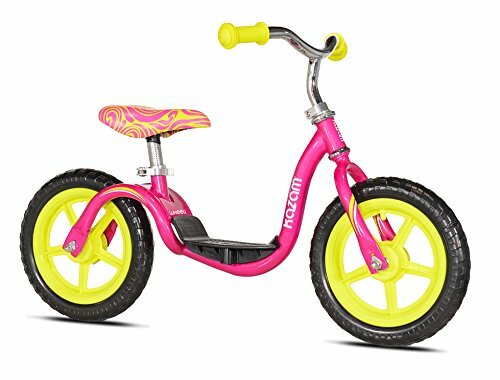 Ultimately you’ll get a good balance of weight and durability with foam tires, giving your kids a decently smooth and comfortable ride. If you want pure comfort go for the air tires just remember air tires will be heavier although a bit more durable. 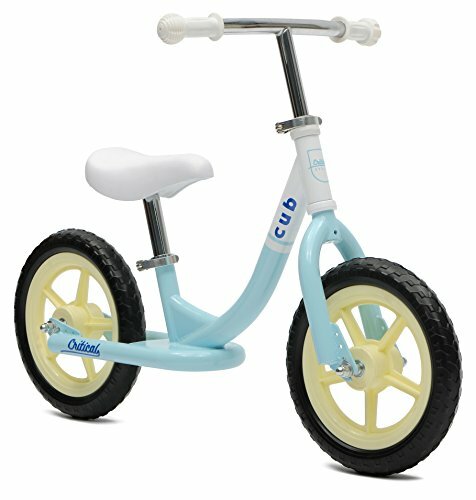 Just like tires, different balance bikes are made from various frame materials. There are metals, alloys, and even woods! Metal bikes, obviously, tend to be heavier than the rest. They are most suitable for heavier and older kids though. In terms of resilience, they are top-notch. But like all metals, they are prone to rust and paint chips. 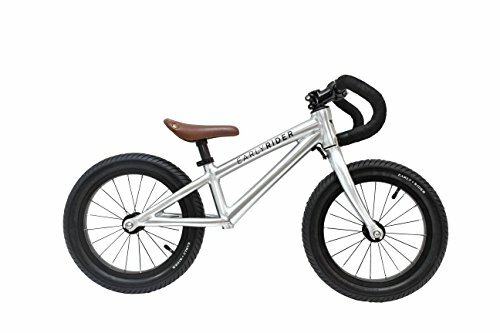 Aluminum or alloy bikes are best for those who are hunting for lightweight balance bikes. They are appropriate for kids below 3 years old. The weight capacity limit of these kinds of bikes is between 60 and 75 lbs. Once the max weight limit is achieved, most kids find it easy to shift to learning a pedal bike. Composite bikes are the newcomers and have gained increasing popularity. Their frames are lightweight, almost indestructible, and easy to clean. But its key feature is they are able to survive most extreme weather conditions. Wood frames are the most environment-friendly of them all. But in terms of adjustability, they certainly have their limitations. They are best for flat or hard terrain surfaces and urban areas. 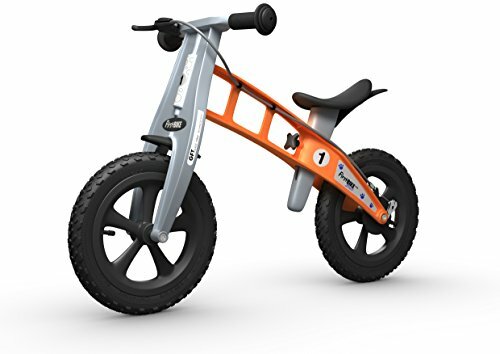 Balance bikes turning limiter prevents both the handlebars and front wheel from steering a full 360 degrees and creating sharp turns. This reduces the potential risks of injuries and falls. Some bikes come with turning limiters, while others don’t. Hand grips, while considered minor a feature, provide comfort and protection to the riders. They help absorb impact and keep the child’s hands safe from being accidentally scratched or pinched in case an accident occurs. Which is better: balance bikes or training wheels on a pedal bike? Kids who have learned to ride a bike using training wheels might need to relearn how to ride a bike without them. Children who are used to stabilizers are likely to depend on them greatly and they tend to have no sense of coordination. Once maintained, balance bikes give your children more focus and control. Often times, training wheels are not spread evenly on the ground. With this in mind, trikes lean to one side. There are two potential problems for this issue. First, the child will compensate their weight on one side, and this will only be corrected once they shift to a regular two-wheeler. Second, it can present hazards especially when moving at faster speeds and at an uneven surface. In addition, training wheels tend to hold the bike vertically. This prevents the child from correctly maneuvering the bicycles when cornering or turning directions since they are always upright. A balance bike will develop and boost the maneuverability skills of kids, which are important when transitioning to a two-wheel pedal bike. 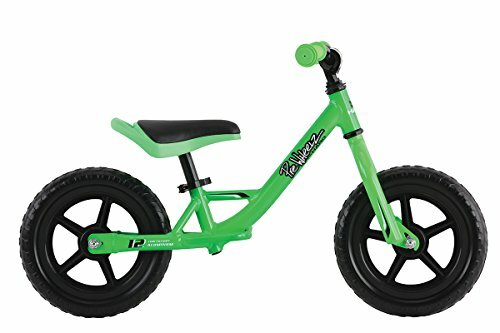 When to buy a balance bike? There are different balance bikes designed for various ages. The smallest balance bike is suitable for toddlers as young as 18 months old. Toddlers can easily jump on a balance bike and begin scooting around. The longer exposure kids have on a balance bike, the faster they will likely master their skill. Usually, they move up to a regular bike at the age of 4 years. Can’t I just remove the pedals off a bike? The pedal bike is harder to maintain, and they are way heavier than a balance bike. They are not a wise option for toddlers and preschoolers too. Besides, a balance bike offers more independence and is a great exercise in coordination and movements. Mastering the art of riding a balance bike is the best foundation for getting on a pedal bike in the future. Again the main reason being a pedal bike with training wheels teaches a kid how to pedal not balance. A traditional pedal bike will also have a seat height that is too high. Although it only looks like a toy to kids, there are some benefits they can actually reap from using a balance bike. First, it is way safer and more practical compared with tricycles and stabilizers. Instead of learning how to pedal, balance bikes will teach kids how to balance. That being said, they are unlikely to fall as they are more prepared for an unexpected loss in balance. Second, balance bikes give kids an avenue of learning and independence. It can provide kids with a sense of accomplishment and freedom. Also, experts have noted that kids who ride balance bikes shift to regular pedal bikes earlier than kids who used training wheels. Balance bike riders usually begin riding a pedal bike at 3 to 4 years old, while training wheel riders start at 5 or 6 years old. Third, it encourages families to do more outdoor activities. Kids these days are always on their gadgets and social media. Letting them cruise along sidewalks or bike paths would be a nice family thing to do. And since it does not have bulky pedals on the sides, transporting balance bikes is easy. Before you know it your kid will be riding a mountain bike with a hand brake after a few months of balance bike riding. How do I teach my kid to ride a balance bike? Before anything else, make sure that your child has worn a helmet properly and the saddle and handlebars have been adjusted accordingly. It is important to show kids how to lean on the bike and swing their legs over. Both feet should be able to touch the ground and both hands on the handlebars. If there are brakes, make sure the kid can easily reach it. Allow the child to get on and off the bike independently. Never lift them over. Encourage kids to walk slowly with the bike and push on the ground using their feet. Remind them that if they want to stop, they simply need to stop walking. Allow them to sit up, and remember to tell them to always look where they are heading. Repeat this step until they are able to sit naturally and gain some speed. Once mastered, encourage them to start taking longer steps. You can verbally guide them too so they won’t get distracted or confused. Find a gentle slope and encourage them to try to lift their feet from the ground. This is a reason why the best balance bikes should have footrests that allow them to glide and not interfere with their strides. The best balance bikes are easy to use and get used to. Most kids do take some time to grow accustomed to riding their balance bike. After they are able to comfortably lift their feet, it is time to teach them how to steer. Let the kids lean slightly and turn the handlebars gently. Most of the bikes on our best balance bikes list feature turn limiters, which are beneficial and a primary reason why these bikes are superior to the pedal bike. On the pedal bike, it’s a free for all in the turning department allowing a young rider to turn so far as to fall over. With a turn limiter, a young rider is restricted on how far they can turn the handlebars. Just another powerful reason to opt away from a pedal bike and opt into the balance bike. Remind them that they can stop by putting their feet down. But for balance bikes with a hand brake, this is the best time to teach them how to gently squeeze the lever. In our opinion we don’t really view the hand brake as important and here’s why. When teaching your kids to ride a balance bike that’s what you are doing, adding a hand brake complicates things. Instead of the child concentrating on grabbing the hand brake, they can focus on riding their new bike. As soon as the kid masters these basic steps, they can then move on to the next level. Also, try to make learning fun by creating some challenging activities or obstacles. Furthermore, keep in mind that kids easily get bored. So, stop your practice before this even happens. As much as possible, keep their cycling activity as fun, positive, and encouraging. Overall, children’s cycling life should start with a balance bike. It helps them develop all the necessary balance skills to cycle. Hopefully, this guide on the best balance bikes will help you make a well-informed decision and select the best balance bike for your kids.